FACT: You no longer control the flow of information about your product during the buyer’s journey from awareness to final purchase. Today’s easy access to information — primarily through the internet — allows buyers to direct themselves much further down the path to satisfying their product needs, without any direct contact with the manufacturer/seller. Easy internet access changed everything — enabling buyers to not only easily research possible solutions and product information, but also to network with peers, access industry associations, and even attend virtual trade shows and events. In fact, depending on which study you read, as much as 80% of today’s buyer’s journey is complete BEFORE the prospect reaches out to your sales team. I would argue this may be even higher if you’re selling products to technical types like engineers who generally prefer to research on their own and dislike talking to sales people. 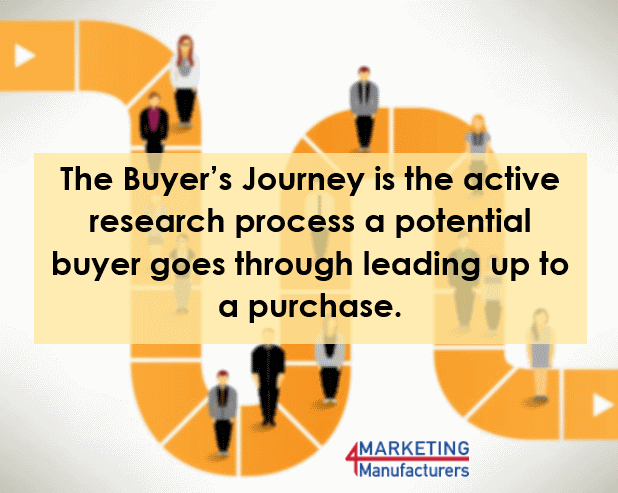 And if you are not “found” during these early Awareness and Consideration stages of the buyer’s journey, how will you even make the short list of vendors the buyer will reach out to? Think about that a minute – this means marketing is now responsible for about 70% of the buyer’s journey and sales is responsible for only about 30%! But have your sales and marketing teams changed to respond to this new buyer’s journey? The buyer’s journey defines the typical actions and steps a prospective buyer takes from first understanding their problem to finally purchasing a solution. There are many different models of buyer’s journeys available, some more granular than others. I prefer HubSpot’s Buyer’s Journey, shown in the graphic below, because it is easy to understand and more than adequate for most small to medium size manufacturers. 1. Awareness – buyer is researching their problem online and offline to better understand if it’s worth further investigation. 2. Consideration – buyer is researching and evaluating the different solution strategies, comparing these solution strategies, and comparing specific vendors and suppliers within the approach that best fits their needs. This is where the buyer creates their vendor short list and probably reaching out to your sales team for the first time to understand and compare the specific products, services, and capabilities of each. 3. Decision – buyer is justifying the selection and getting internal approval, negotiating the final price and terms, and making plans for purchasing and using your product. With this understanding of the buyer journey think about how this changes marketing and sales roles within your manufacturing organization. The Awareness stage of the buyer’s journey has traditionally been and still is marketing’s responsibility. In this initial stage marketing primarily used outbound tactics to “spread the word” and make your target prospects aware of your products. So marketing relied on advertising, trade shows, press releases and other publicity to increase awareness. But now marketing must be everywhere the buyer is as they perform their jobs, network with peers, research their situation and problem, and search for solutions. Marketing must be online and offline to increase awareness and break through all the clutter to engage prospects. In the past, buyer’s in the Consideration stage were forced to contact your company to get basic product specifications and learn about your solution, so this stage was largely handled by the sales team. But today’s buyer can now get this information, literally at their fingertips, without reaching out to your sales team. So now marketing must be very active in the Consideration stage alongside sales. This means marketing’s role and budget must expand to include nurturing prospects into and through much of the Consideration stage, i.e. responsible for generating qualified leads for the sales team. In fact, most marketing teams are now measured in part by the number of leads generated and revenues attributed to their efforts. So is sales just taking orders then? Far from it! If your marketing efforts are effective, sales now receives fewer, but much better qualified leads. So instead of spending the majority of their time in the Awareness stage prospecting, cold calling (who ever thought that was a worthwhile use of a sales person’s time!) and working too many dead end “leads”, they are helping buyers in the latter portion of the Consideration stage and working through the Purchase stage to close the deal. In many manufacturing companies, especially those selling complex products or capital equipment, direct sales people and/or manufacturer’s reps are highly compensated. So providing them with qualified leads makes their time more productive, resulting in higher close rates and shorter sales cycles. Another result of today’s buyer’s journey is that marketing and sales need to be more closely aligned and working in sync. The sales and marketing relationship should be a real meeting of the minds to achieve revenue goals. For example, there needs to be agreement on what criteria defines a MQL ready for sales. Marketing and sales need to be supporting each other and collaborating to ensure things like value proposition, messaging, sales tools, and content are working effectively. In addition, today’s buyer knows more about your competitors than ever before, so marketing and sales need to know more about the competition to sell against and differentiate your value. Now let’s dig deeper into the new aspects of marketing’s role. With today’s buyer increasingly avoiding advertising (ad blocker apps, email spam filters) and the decrease in print advertising, especially with trade journals transitioning to the web, marketers must change their awareness advertising strategy. While brand advertising is still important for many manufacturers, more advertising resources are now being devoted to ads that pull prospects to your website using educational and engaging content that solves your prospects’ problems, not touting how great your product or company is. Manufacturing marketers are integrating old and new tactics such as Google AdWords, trade shows, conference sponsorship and speaking, search engine optimization (SEM), social media, blogs, and content marketing to increase awareness. Whether you sell your products directly to consumers or business customers, or use resellers, distributors and/or manufacturer’s reps, marketing must adopt appropriate strategies and tactics to reach and engage during today’s buyer’s journey. In the Consideration stage marketing is again using an integrated combination of online and offline tactics such as webinars, blogs, content marketing, and email nurture campaigns (not batch and blast emails!) to educate, engage, and move buyers toward your product solution and a qualified lead ready for handoff to sales. Especially during the consideration stage marketers need to measure and track results to learn what works using a planned iterative approach. For example, testing subject lines in email nurture campaigns, different content formats, and web landing pages, marketing can improve results and dedicate resources to the tactics that deliver the best results. Manufacturers with low volume/high dollar products may be able to handle these marketing activities manually using internal or external resources. But most manufacturers have sufficient prospect, lead, and customer volume to warrant the need for marketing automation software and other tools, or a marketing agency to manage and support their marketing activities and track results. Even in the Purchasing stage, largely handled by sales, marketing must continue to provide both support to sales (sales enablement tools such as ROI and total cost of ownership calculators, slide decks, product data sheets, product specific case studies, competitor comparison guide) and continue nurturing buyers with relevant content to help close the sale. And of course marketing’s work doesn’t stop with the sale. Marketing must also work to retain existing customers and look for opportunities to cross sell and upsell. So manufacturing marketers need to support sales and drive revenues along the entire buyer’s journey and customer life cycle. As we’ve mentioned, marketers have many tools and tactics available, but that doesn’t mean every manufacturer should use them all. Your manufacturing business situation is unique, from the complexity and/or uniqueness of your product to sales volumes, level of product customization, who buys your prospects, and market maturity. So the best marketing strategy and tactics are those that fit your specific situation and will effectively reach your buyers where they are. So what tactics will be the most effective for you? Well, if you sell a complex, made-to-order product to manufacturing process design engineers and managers, then product ads, an ecommerce site, and special sale offers won’t do much to gain awareness and engage buyers. However, an SEO optimized website, content marketing, and an AdWords campaign can more effectively engage and move prospects along the buyer’s journey. If your strategy is to move into a new vertical segment where buyers aren’t familiar with your type of solution, much less your product, then marketing will need to spend more resources on brand advertising and educating buyers during the awareness stage. 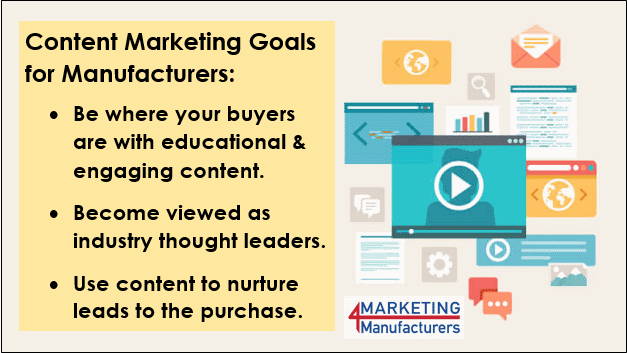 Today’s buyer’s journey means manufacturers need to spend more resources on marketing to ensure prospects are not only aware of your product, but consider your solution worthy of their short list. 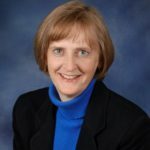 Indeed, taking full advantage of the changing roles in today’s marketing, especially for manufacturers who don’t have the resources in place, is a critical challenge that must be addressed. I encourage you to contact me to discuss how we can tailor a marketing plan for you. You can get the conversation started by indicating the areas we should discuss using the input form BELOW. I look forward to to speaking with you soon and learning more about your company.